We clear your consumption "at a standstill": waste, fraud, etc. for an immediate return on investment. Then we improve your driving consumption to increase your financial gains. 30 to 50 liters during the day! For each anomaly: alertgasoil™ answers questions Where, When, Who, How and How much? December, the 16th at 12:43pm, siphoning of 54,2 litres from the tank of the vehicle BQ-975-BS. The reporting highlights the engine On and the inserted driver card. 500 to 700 litres over the night! Siren 110 db (3 meters) to break external thefts. July the 24th, attempted theft on the vehicle. The siren rings after 2 min and the theft is stopped, protecting the remaining 540 Litres. while refueling! Anomalies are directly highlighted in our invoice checking. Automatic alerts on board and to the back office. Time with Motor On while Vehicle at a Standstill. Strictly longer than 6 minutes, without power take-off on. Traffic lights, trafic etc. are excluded. Less wasted work time and over consumption related to heavy dead weight carried. alertgasoil™ shows the stock level in real time and indicates when to fill up. Automatic reports allow you to follow in real time the optimization’s results..
Useless fill-ups are made after every tour, causing: a useless working time (15 min/fill-up), 682kg of carried fuel and as much cashflow in the tank. *682kg transported over a month and over a distance of 17 782km cause an overconsumption of 292L per month. Inform and be informed in real time thanks to sms and email alerts suited to your company. On April 2, a theft was detected on vehicle JK-230-FD. The alarm is triggered and you receive an sms. 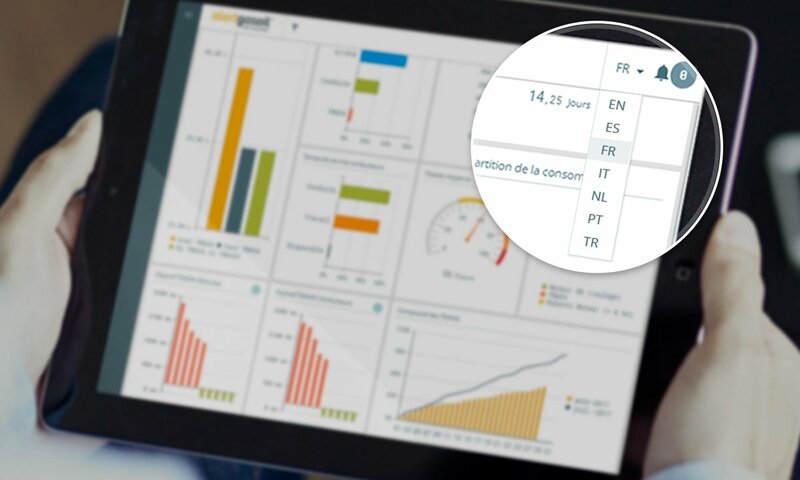 alertgasoil™ eco-driving service provides you daily scoring reports to monitor efficient driving behavior, with explicit information directly exploitable to complete your trainings. Setting of each vehicle and follow-up of global scores and details for all your drivers directly on the AGPro main application. Consult and export consolidated data of drivers or vehicles for a selected period. Find out the statistics history. Retrieve consumption information and statistics of a driver, vehicle, and the group they belong to. RECEIVE YOUR TICPE AUTOMATICALLY FILLED IN. Recover your domestic fuel consumption tax on energy products document automatically filled in with your data. Automatic generation twice a year of your TICPE. Track your vehicles in real time and display previous journeys. Access all steps and events on a journey thank to the data cross-analysis. Remap routes and events’ history for each vehicle of your fleet. In a single click, get access to driver and vehicle data in real time. Consult your driver and vehicle data in real time on the main AGPro application. Monitor your drivers and their remaining driving time. Fleet equipped with alertgasoil™ system : a level 4 information in a single click. Level IV : Highest Reliability in Europe. Automatic and remote download of your C1B and V1B files. Restitution of legal files in compliance with the law. Card reader, up to 20 company cards. Time saving for drivers and for management: no need to stop the vehicles in order to extract vehicle data. All your features together in a modern, fluid and dynamic application. Manage your activity with profiles: Director, Dispatcher, etc. Detailed view of vehicles and drivers. Complete information about the vehicles. French, English, Spanish, Dutch, Italian, Turkish, Portuguese. Customizable indicators based on your activity. Global and detailed vision of thefts and idling. Retrieve and exploit your raw data thanks to our webservices and integrate it into your ERP, business applications etc.